Stay tuned! I know we are! 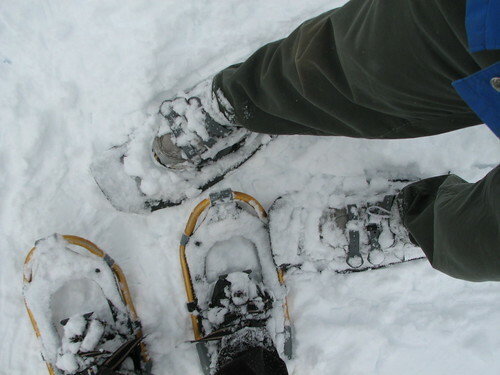 My sister gifted me and Todd a day of snowshoeing for Christmas. This included borrowing her and Mar’s snowshoes, watching Seth, and even a thermos of homemade spiced wine if we needed some warming up on our walk. Awesome! We went on our adventure this last Saturday, even though Seth was coming down with a cold. Sarah tells us she and Seth got in a lot of snuggles while reading and watching the Muppet Show. Meanwhile, Todd and I drove up to Steven’s Pass, and hiked up toward Skyline Ridge. It was fun, but so much work, too! Granted, Todd tells me that we (I) tend to go fast when hiking on bare ground, and slapping snow shoes and ten feet of snow under us didn’t seem to make me want to adjust my pace. After an hour we reached a dead end, though I don’t know if it was actually the top of the ridge, as there was another, much smaller trail a little way below the dead end. We’ll have to come back in summer and compare notes. Then we turned around and hiked down, and passed lots of folks on their way up with snow-camping gear. Maybe next time… Then after a pizza lunch, we headed back home. Thanks for the great day out, Sarah! My dream is to have a dining room table that is never empty. I imagine a Saturday afternoon someday where Seth and his friends are playing games on the table while I’m in the kitchen cooking. The phone rings; maybe the Sands didn’t have plans for that evening, and they are inviting themselves over on short notice. Great! I grab a jar of vegetables I pickled earlier in the summer from the pantry, and use it to stretch out the meal a little bit further. I hear a knock at the door – Corey and Melinda have brought their daughter over because she wanted to play with Seth, and we get to talking in the kitchen and before we know it, they’ve agreed to stay over for dinner as well. Heather is so excited by a craft she just made that she brings it and a loaf of bread over to our house, because she knows the door is always open and there’s always an open chair at the table, and Mike joins the rest of the guys for a quick round of video games in the living room while the sauce simmers in the kitchen. We’re halfway through the meal, and the doorbell rings – my sister’s family was driving up north, and needed to stop somewhere for dinner along the way. No problem – I scrounge in the fridge and pull together a quick salad, and we all sit down around our long table to enjoy a meal. People filter out slowly after the meal, and the kids go to bed, but there’s still a few of us sitting around, and Aaron stops by to join us for a glass of wine and a movie or hanging out in the backyard and talking. Or maybe the night involves a long 6-hour campaign of Risk while we eat snacks around the table. Or maybe it’s the setting for a poker night. Or for a soup swap. Or for a big finger-painting party for the kids in the neighborhood. That’s my big dream. I used to dream about being a musician, or an NBA star, or an astronaut. Now, I dream of having a table full of friends. the eelfang chronicles is powered by	WordPress 3.6 and delivered to you in 0.261 seconds using 37 queries.